Freelancers often lack mastery of tools that are available to us. This is especially true of wildcarding. This lack of mastery results in our either not using the tools at all or using them to less than their full potential. These are tools that could save us time, increase accuracy, and, most importantly, make us money. Although we have discussed wildcard macros before (see, e.g., The Only Thing We Have to Fear: Wildcard Macros, The Business of Editing: Wildcard Macros and Money, and Macro Power: Wildcard Find & Replace; also see the various Lyonizing Word articles), after recent conversations with colleagues, I think it is time to revisit wildcarding. Although wildcards can be used for many things, the best examples of their power, I think, are references. And that is what we will use here. But remember this: I am showing you one example out of a universe of examples. Just because you do not face the particular problem used here to illustrate wildcarding does not mean wildcarding is not usable by you. If you edit, you can use wildcarding. We begin by identifying what needs a wildcard solution. 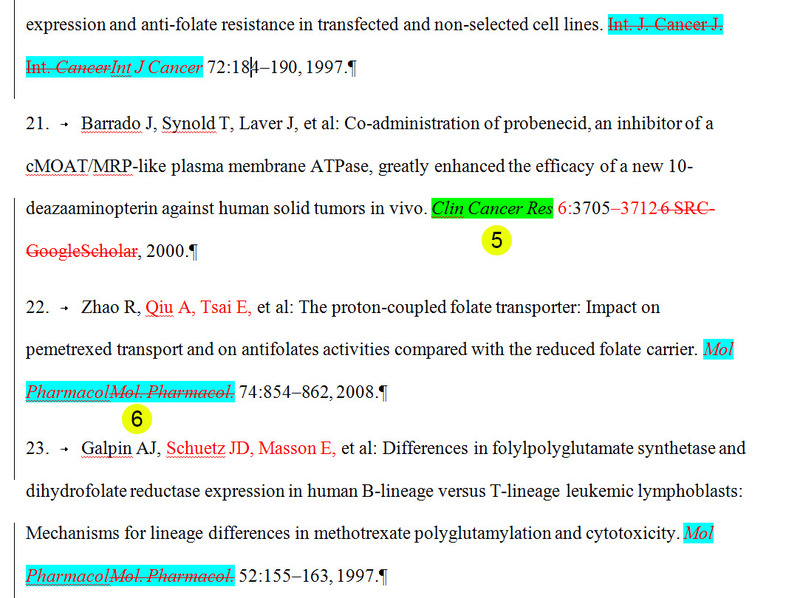 The image below shows the first 3 references in a received references file. This was a short references file (relatively speaking; I commonly receive references files with 500 to 1,000 references), only 104 entries, but all done in this fashion. 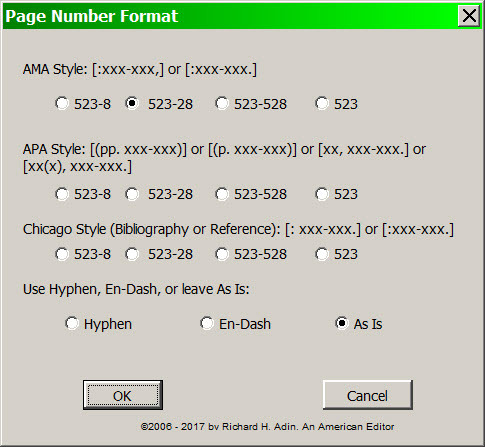 The problems are marked (in this essay, numbers in parens correspond to numbers in the images): (1) refers to the author names and the inclusion of punctuation; (2) shows the nonitalic journal name followed by punctuation; and (3) shows the use of and in the author names. The following image shows what my client wants the references to look like. Compare the numbered items in the two images: (1) the excess punctuation is gone; (2) the journal title is italicized and punctuation free; and (3) the and is gone. It is true that I could have fixed each reference manually, one-by-one, and taken a lot of time to do so. Even if I were being paid by the hour (which I’m not; I prefer per-page or project fees), would I want to make these corrections manually? I wouldn’t. Not only is it tedious, mind-numbing work, but it doesn’t meet my definition of what constitutes editing. Yes, it is part of the editing job, but I like to think that removing punctuation doesn’t reflect my skills as a wordsmith and isn’t the skill for which I was hired. I will admit that in the past, in the normal course, if the reference list were only 20 items long, I would have done the job manually. But that was before EditTools and its Wildcard macro, which enables me to write the wildcard string once and then save it so I can reuse it without rewriting it in the future. In other words, I can invest time and effort now and get a reoccurring return on that investment for years to come. A no-brainer investment in the business world. CAUTION: Wildcard macros are very powerful. Consequently, it is recommended that you have a backup copy of your document that reflects the state of the document before running wildcard macros as a just-in-case option. If using wildcard macros on a portion of a document that can be temporarily moved to its own document, it is recommended that you move the material. Whenever using any macro, use caution. 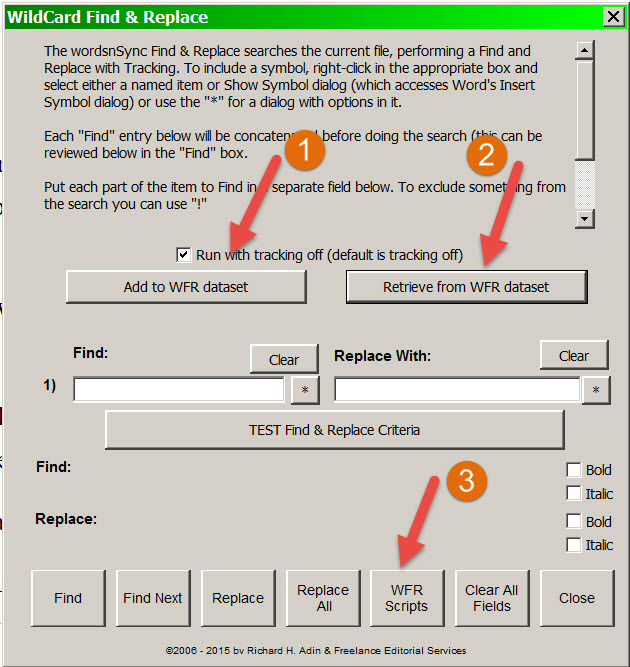 As an example, if I click Retrieve from WFR dataset (#2 above), the dialog shown below opens. In this instance, I have already created several strings (1) and I can choose which string I want to run from the dropdown. Although you can’t see it, this particular dataset has 40 strings from which I can choose. 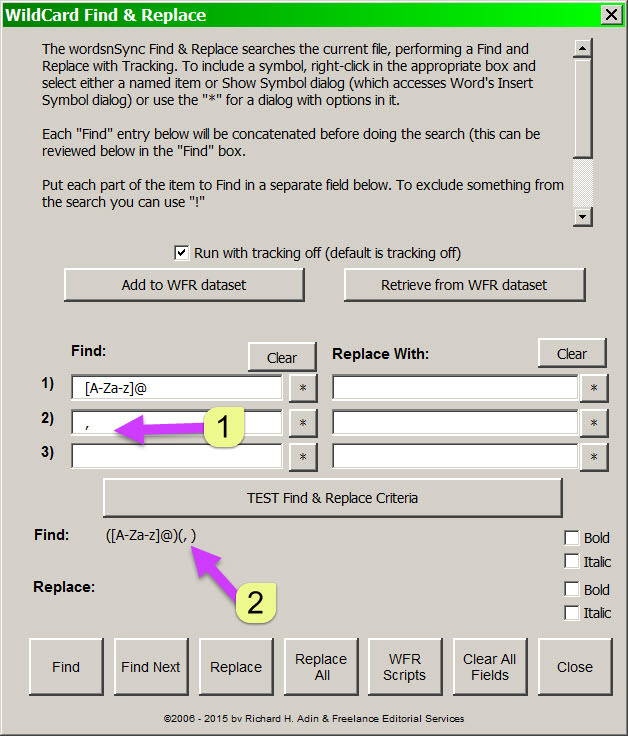 After choosing the string I want to run, it appears in the Criteria screens (2 and 3), divided into the Find portion of the string and the Replace portion. I can then either Select (4) the strings to be placed in primary dialog box (see Wildcard Interface above) or I can Edit (5) the strings if they need a bit of tweaking. If I click Select (4 above), the strings appear in the primary Wildcard dialog as shown below (1 and 2). Because it can be hard to visualize what the strings really look like when each part is separated, you can see the strings as they will appear to Microsoft Word (3). In addition, you know which string you chose because it is identified above the criteria fields (purple arrow). Now you have choices to make. 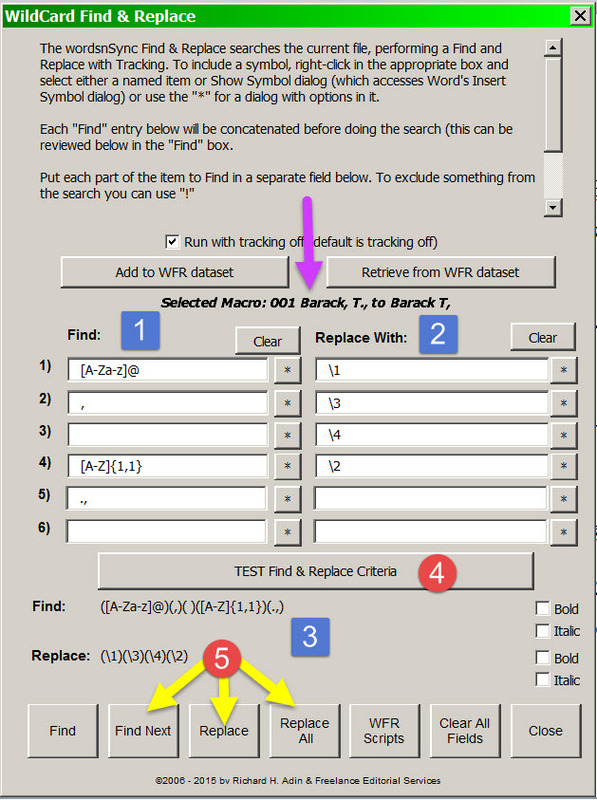 You can choose to run a Test to be sure the criteria work as expected (4), or if you know the criteria work, as would be true here, you can choose to Find and Replace one at a time or Replace All (5). I know that many readers are saying to themselves, “All well and good but I don’t know how to write the strings, so the capability of saving and retrieving the strings isn’t of much use to me.” Even if you have never written a wildcard string before, you can do so quickly and easily with EditTools. which makes up a unit. That is, a unit is the group of items that need to be addressed as a single entity. 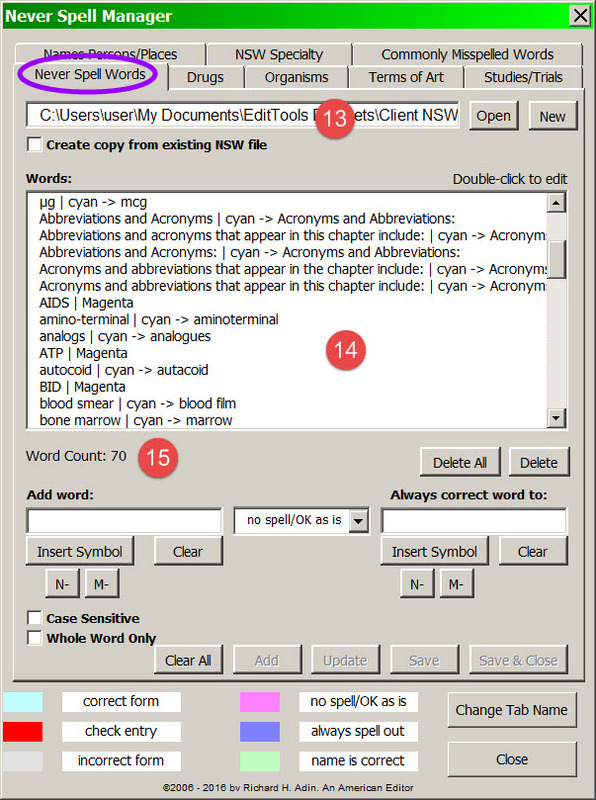 In this example, each complete author name will constitute a unit. This first unit has 6 parts to it (1 part = 1 bracketed item) and we have identified what each part is (e.g., [MIXED case multiletter surname]). 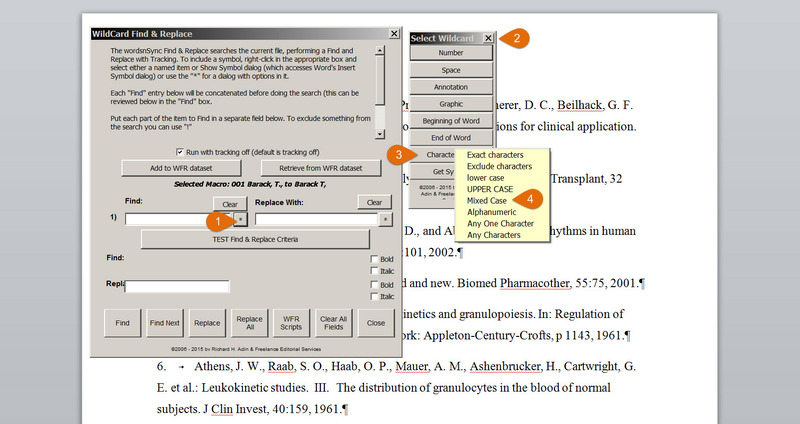 To find that first part we go to the Wildcard dialog, shown below, click the * (1) next to the blank field in line 1. Clicking the * brings up the Select Wildcard menu (2) from which we choose we choose Character Menu (3). In the Character Menu we choose Mixed Case (4) because that is the first part of the unit that we need to find. 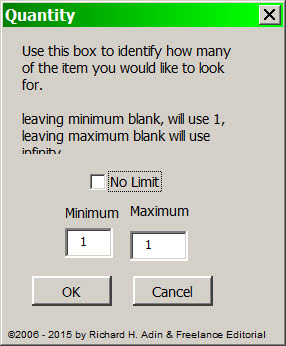 When we choose Mixed Case (4 above), the Quantity dialog below appears. 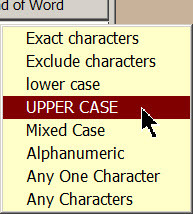 Here you tell the macro whether there is a limit to the number of characters that fit the description for this part. Because we are dealing with names, just leave the default of no limit. However, if we knew we only wanted names that were, for example, 5 letters or fewer in length, we would decheck No Limit and change the number in the Maximum field to 5. Clicking OK in the Quantity results in entry of the first portion of our string in the Wildcard dialog (1, below). This tells the macro to find any grouping of letters — ABCd, Abcde, bCdaefTg, Ab, etc. — of any length, from 1 letter to 100 or more letters. Thus we have the criteria for the first part of our Find unit even though we did not know how to write wildcardese. 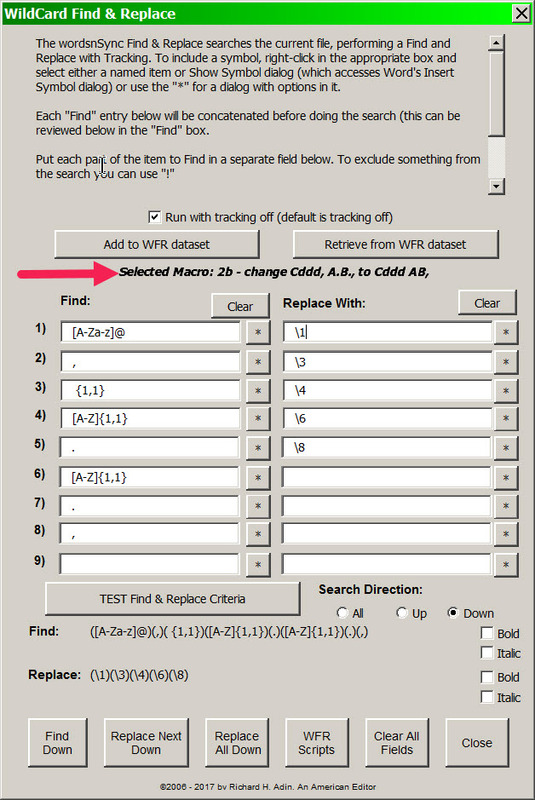 In the dialog, you can see how the portion of the string really looks to Microsoft Word (2) and how, if you were to manually write this part using Microsoft Word’s Find & Replace, it would need to be written. The next step is to address the next part, which can be either [comma] alone or [comma][space]. What we need to be careful about is that we remember that we will need the [space] in the Replace string. If we do [comma][space] and if we do not have just a [space] entry, we will need to provide it. For this example, I will combine them. The remaining parts to do are [single UPPERCASE letter][period][comma]. They would be done using the same techniques as the prior parts. Again, we would have to decide whether the [period] and [comma] need to go on separate lines or together on a single line. Why? Because we want to eliminate the [period] but keep the [comma]. If they are done together as we did [comma][space], we will manually enter the [comma] in the Replace. 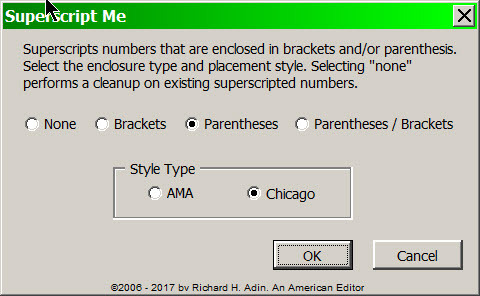 Clicking OK takes us to the main Wildcard dialog where the criteria to find the [single UPPERCASE letter] has been entered (1, below). Looking at the image below, you can see it in the string (2). For convenience, the image also shows that I manually entered the [period][comma] on line 4 (3 and 4). The next step is to create the Replace part of the string. Once again, we need to analyze our Find criteria. Because what we need is available in the Find Criteria, we click on Find Criteria. However, the Select Wildcard dialog also gives us options to insert other items that aren’t so easy to write in wildcardese, such as a symbol. 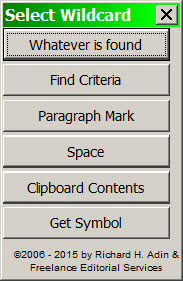 When we click Find Criteria, the Use Find Criteria dialog, shown below, appears. 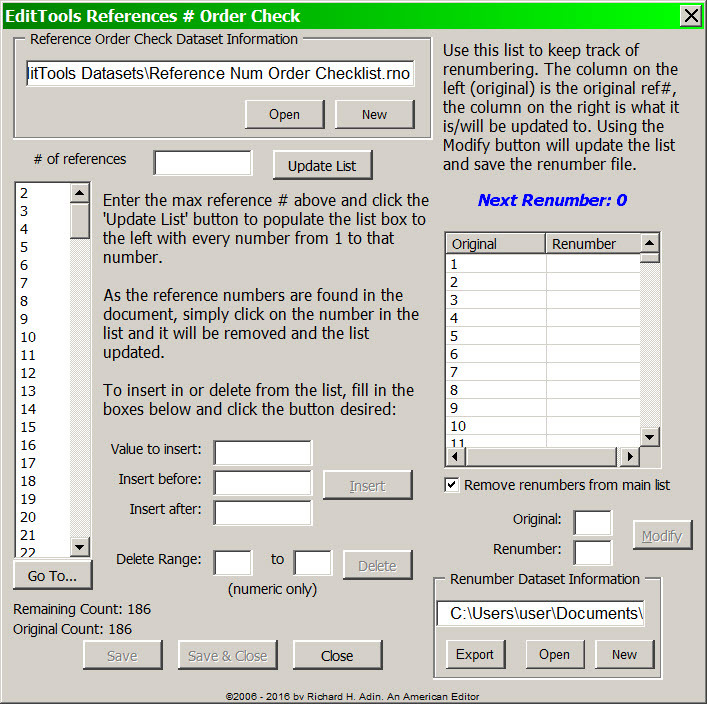 It lists everything that is found in the Find criteria by line. 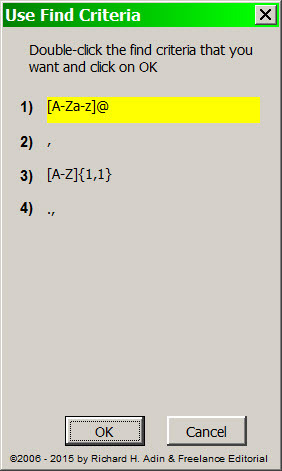 Double-clicking the first entry (yellow highlighted) places it in the first line of the Replace, but by a shortcut — \1 — as shown in the image below (1). 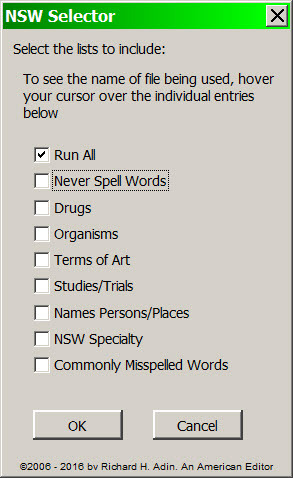 If we wanted to reverse the order (i.e., instead of ending up with Kondo M, we want to end up with M Kondo,), we would select the line 3 entry in the Use Find Criteria Dialog above, and double-click it. Then \3 would appear in the first line of Replace instead of \1. For convenience, I have filled the Replace criteria (1-4) as The Completed Wildcard Macro image above shows. The [space] (2) and the [comma] (4) I entered manually using the keyboard. The completed Replace portion of the string can be seen at (5). 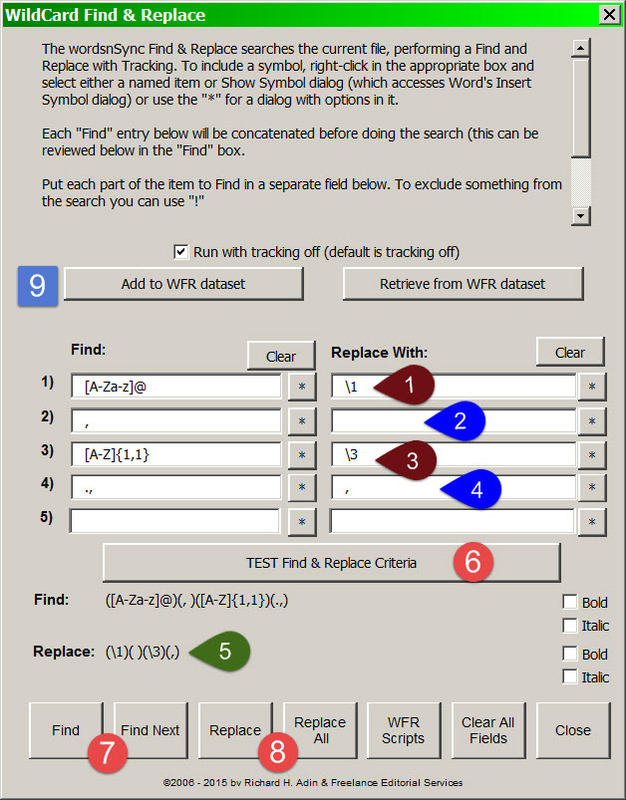 The next decision to be made is how to run the string — TEST (6) or manual Find/Replace (7) or auto Replace All (8). If you have not previously tried the string or have any doubts, use the TEST (6). It lets you test and undo; just follow the instructions that appear. Otherwise, I recommend doing a manual Find and Replace (7) at least one time so you can be certain the string works as you intend. If it does work as intended, click Replace All (8). 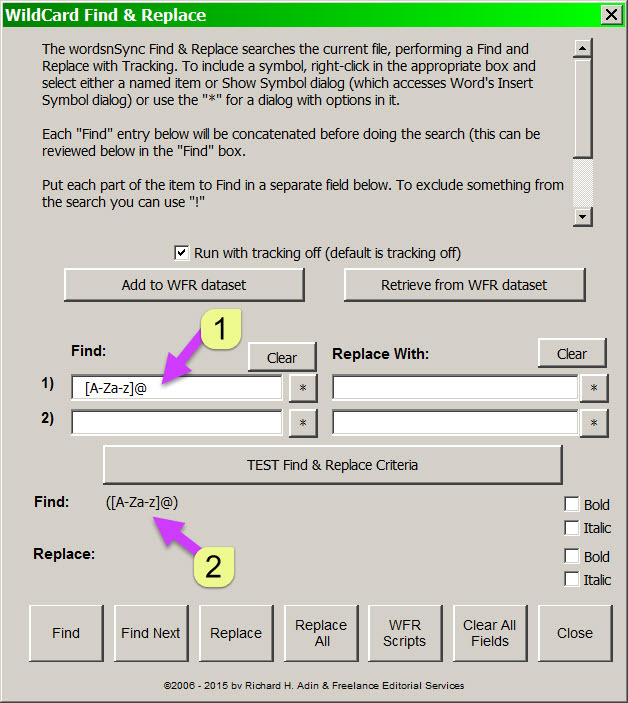 You will be asked whether you want to save your criteria; you can preempt being asked by clicking Add to WFR dataset (9). You can either save to an existing dataset or create a new dataset. 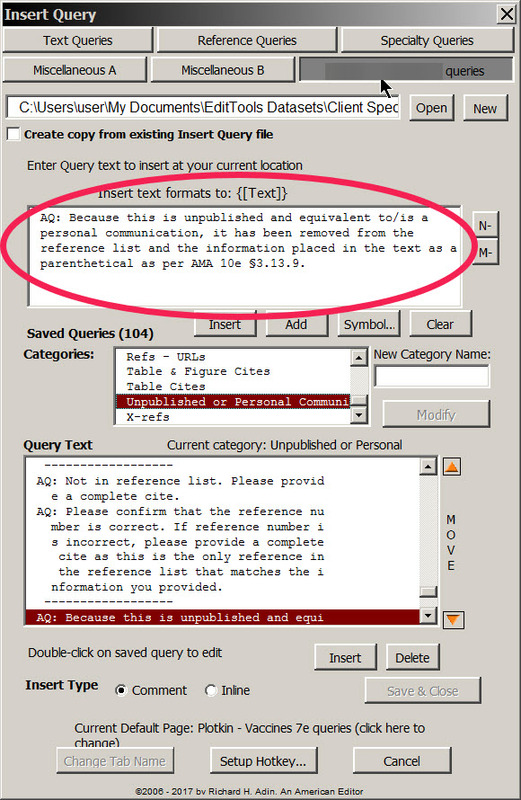 And if you look at the Wildcard Dataset dialog above (near the beginning of this essay), you will see that you can not only name the string you are saving, but you can provide both a short and a detailed description to act as reminders the next time you are looking for a string to accomplish a task. 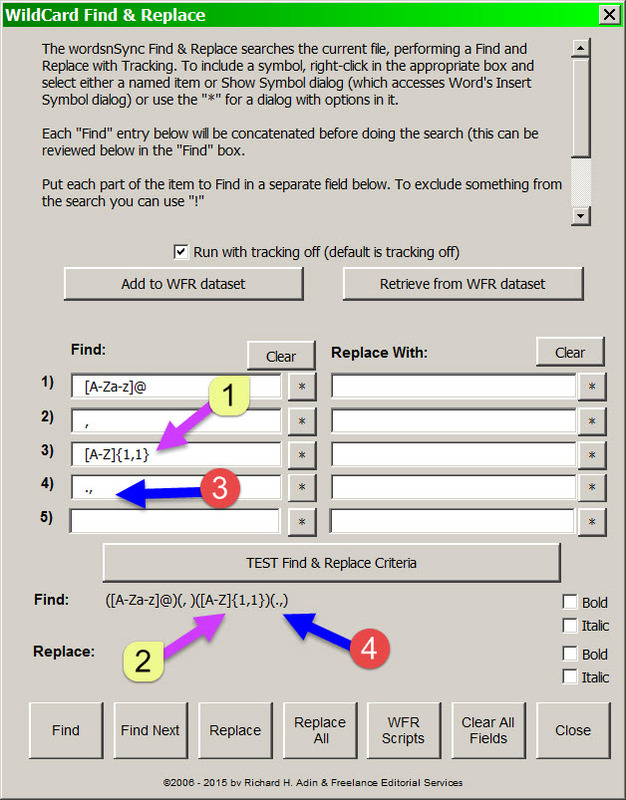 Running the string we created using Replace All on the file we started with, will result in every instance of text that meets the Find criteria being replaced. I grant that the time you spend to create the string and test it will take longer than the second and subsequent times you retrieve the string and run it, but that is the idea: spend a little time now to save lots of time later. I can tell you from the project I am working on now that wildcarding has saved me more than 30 hours of toiling so far. I have already had several chapters with 400 or more references that were similar to the example above (and a couple that were even worse). Wildcarding let me clean up author names, as here, and let me change cites from 1988;52(11):343-45 to 52:343, 1988 in minutes. As you can see from this exercise, wildcarding need not be difficult. 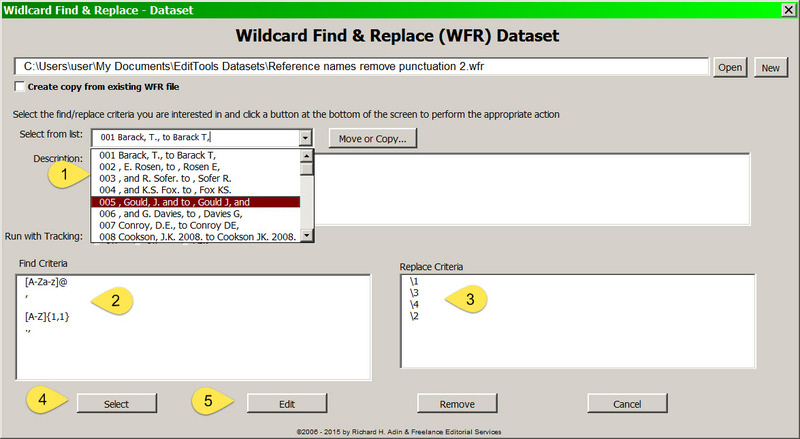 Whether you are an experienced wildcarder or new to wildcarding, you can harness the power of wildcarding using EditTools’ WildCard Find & Replace. 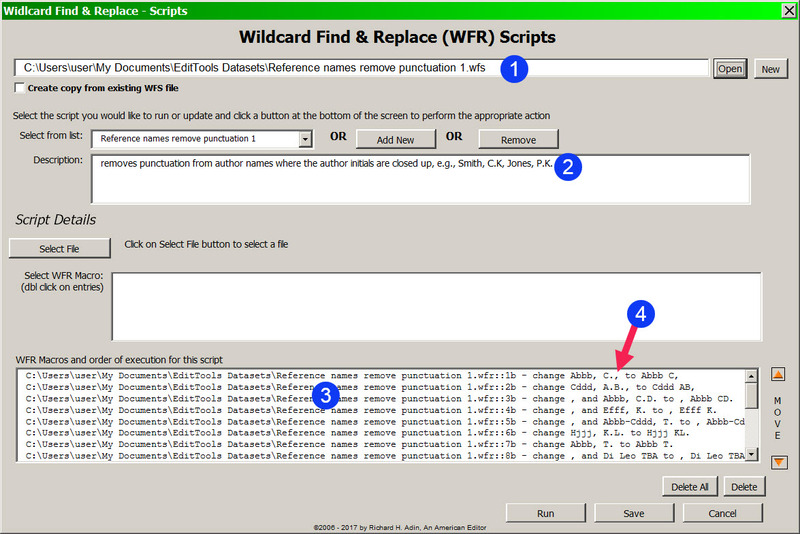 Let EditTools’ WildCard Find & Replace macro system help you. 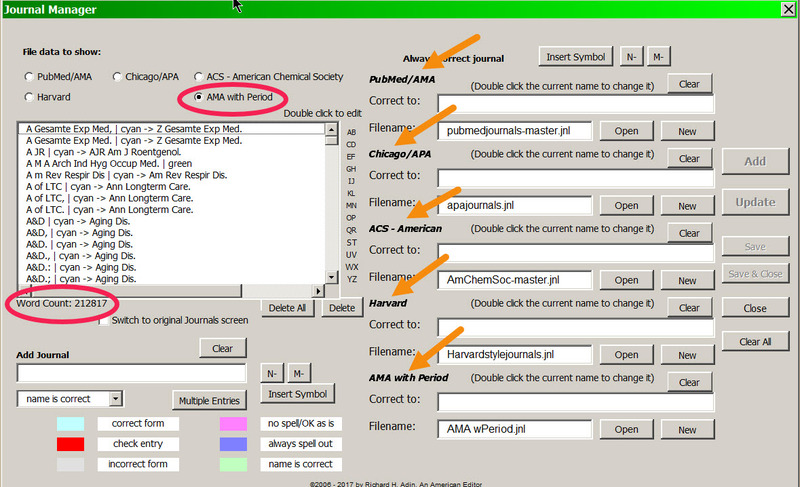 Combine wildcarding with EditTools’ Journals macro and references become quicker and easier.